Infectious mononucleosis: A specific viral infection (with the Epstein-Barr virus) in which there is an increase of white blood cells that are mononuclear (with a single nucleus) "Mono" and "kissing disease" are popular terms for this very common illness caused by the Epstein-Barr virus (EBV). By the time most people reach adulthood, an antibody against EBV can be detected in their blood meaning they have been infected with EBV. The illness is less severe in young children. The infection can be spread by saliva. The incubation period for infectious mononucleosis is 4 to 8 weeks. 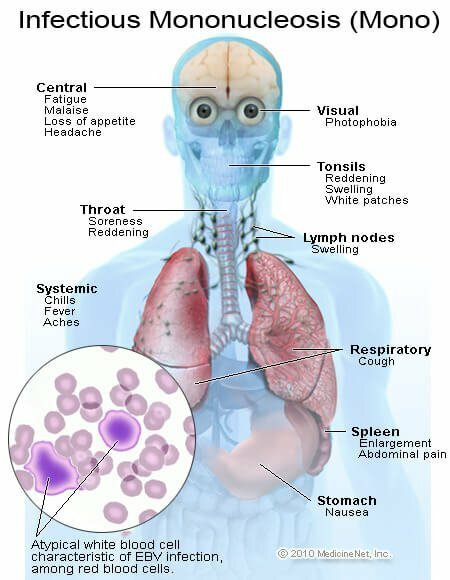 Symptoms include fever, fatigue, sore throat, and swollen lymph glands. "Mono" can cause liver inflammation (hepatitis) and spleen enlargement. Vigorous contact sports should be avoided to prevent spleen rupture.